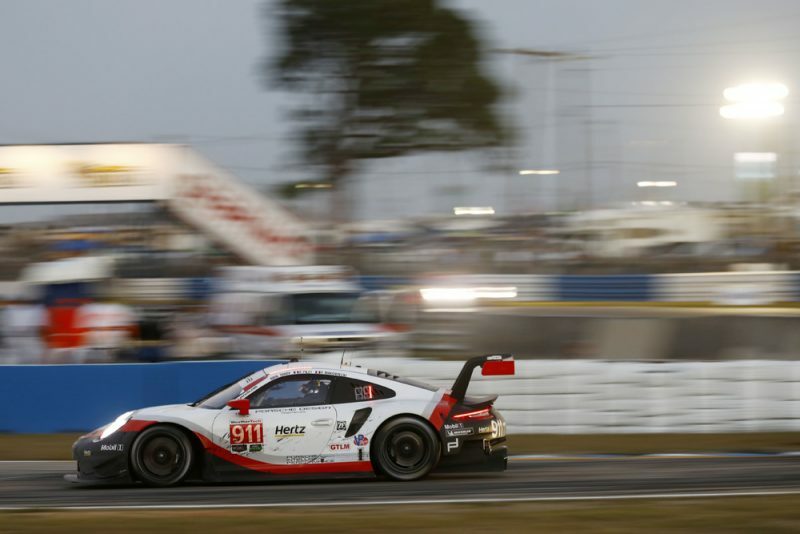 The Porsche 911 RSR has scored its first win of the IMSA SportsCar Championship season at the Sebring International Raceway in Florida. At the 12 Hours of Sebring, the oldest and toughest sports car race in the USA, Patrick Pilet (France), Nick Tandy (Great Britain) and Frédéric Makowiecki (France) won the GTLM class with the 510 hp race car from Weissach after a heart-stopping finale on Saturday. At the wheel of the second 911 RSR fielded by the Porsche GT Team, Earl Bamber (New Zealand), Laurens Vanthoor (Belgium) and Gianmaria Bruni (Italy) swept over the finish line in third place after 328 laps on the famously bumpy airfield circuit. Thus, they crowned Porsche’s success in the race that also counts towards the North American Endurance Cup. Florida proves to be a good hunting ground for the iconic 911 sports car: Only a week ago, the 911 GT3 R won both rounds of the World Challenge season-opener on the St. Petersburg street circuit. In glorious spring weather, a total of 43 vehicles headed off on Saturday morning into the 66th edition of the tradition-steeped race, in which Porsche has made history since 1960 as the most successful manufacturer with 18 outright victories and now 71 class wins. In the cockpit of the #912 Porsche 911 RSR, Laurens Vanthoor took up the race from sixth place on the third grid row and promptly picked up two positions in the first lap. His teammate Nick Tandy, who lined up on the grid directly behind the Belgian in the second 911 RSR (#911), managed to make up three positions: An exemplary start in a hotly contested race that was interrupted in the 14th lap by the first of eleven safety car phases. Thanks to perfect pit stops from the Porsche GT Team and a flawless performance from drivers, the 911 RSR was able to hold its own against tough competition from BMW, Chevrolet, Ferrari and Ford and settle in amongst the frontrunners. In lap 40, Laurens Vanthoor moved into the lead for the first time. After 2:30 hours, his teammate Gianmaria Bruni was running at the front of the GT field. Shortly before halftime, Nick Tandy also joined the list of frontrunners with his 911 RSR. During the second half of the race, his teammate Frédéric Makowiecki dominated the GT field for two hours, only relinquishing the lead spot when he came in for a scheduled pit stop after dark. However, the 911 RSR continued to put the leaders under pressure. Even a torn-off rear diffuser caused by a minor off-track excursion was replaced in record time, and the lost time was quickly regained. The suspense at the Sebring International Raceway continued from the first to the last minute. Fans from all over the country were treated to plenty of gripping race action in all classes, with many fierce battles for positions and constant changes at the front. And the Porsche pilots continued to dazzle: After 10 hours and 10 minutes, in the 279th lap, Patrick Pilet took the lead for the first time in the #911 Porsche 911 RSR. Nick Tandy then defended this position with an inspired drive to the flag. Thanks to this victory, Nick Tandy, Patrick Pilet and Frédéric Makowiecki move up to second place in the driver’s classification. Porsche also advances to second in the manufacturer’s championship. Round three of the IMSA SportsCar Championship is the Long Beach street race in the US state of California on 14 April.